Well, I endured a lengthy internal debate about whether or not to start the week of posts about our beach trip with The Long Journey There, and in the end I've decided to share it. This is mainly because most of you continue to resist the siren song of Twitter, so the majority of you didn't see the few pictures I posted there over the course of our three-day drive. 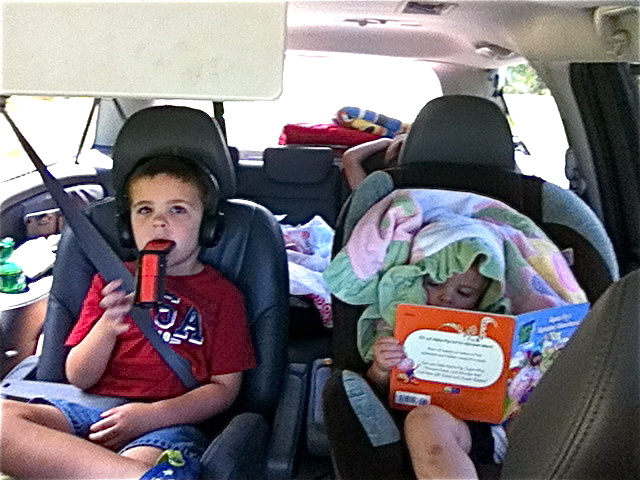 If I told you that -- since we began our drive on July 4th -- I told the kids they were all wearing red-white-and-blue that day, would you be surprised? I THOUGHT NOT. 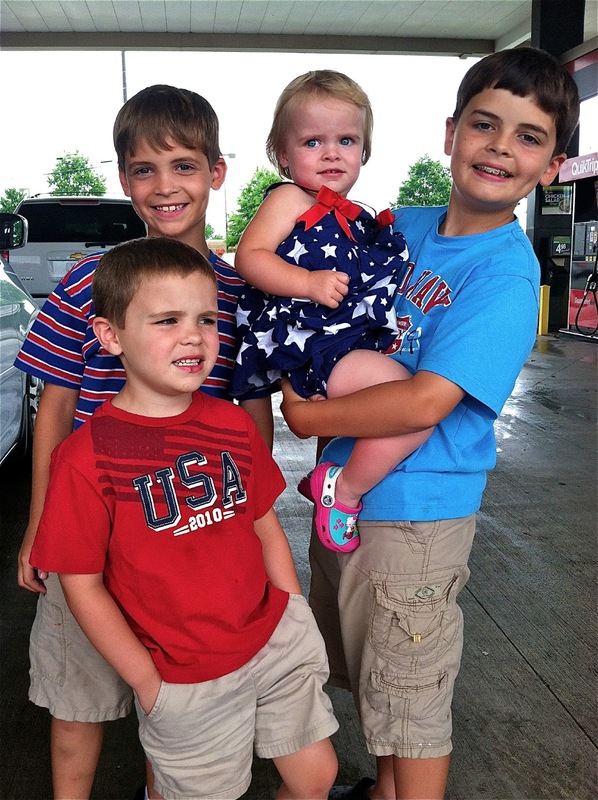 Here they are looking all patriotic at a QT gas station in Georgia, where I insisted that they pose for a picture before they could go in and get a drink. You can tell that this was a very popular decision. Anyway. I bought some window markers before we left town and made a list of the three FAQs of any car trip. Then I wrote them on the rear window of the van and had Grayson keep a running tally on a piece of paper in the front seat. I found the questions much less annoying when each one represented a tickmark. What that tells you about my psyche, I have no idea. We became very popular on the highway and at all of our stops. We had other parents beep their horns and give us thumbs-up signs as they passed us, people tailgating us so they could take pictures of the window with their phones, and people of all ages struck up conversations with us at gas stations and rest areas, interested to know how many kids we have and how much farther we had to go. By Day 2, the kids had gotten very competitive about not being the cause of a tickmark being added to the tally. They got pretty creative with their phrasing ... "Are we any closer to the beach than we were before?" ... "I think Jake chose the last movie, so I might want to watch Rise of the Guardians now." NO DICE. THOSE ALL COUNT. At some point on Day 2, Amelia got upset with Grayson and did something we'd never seen before. 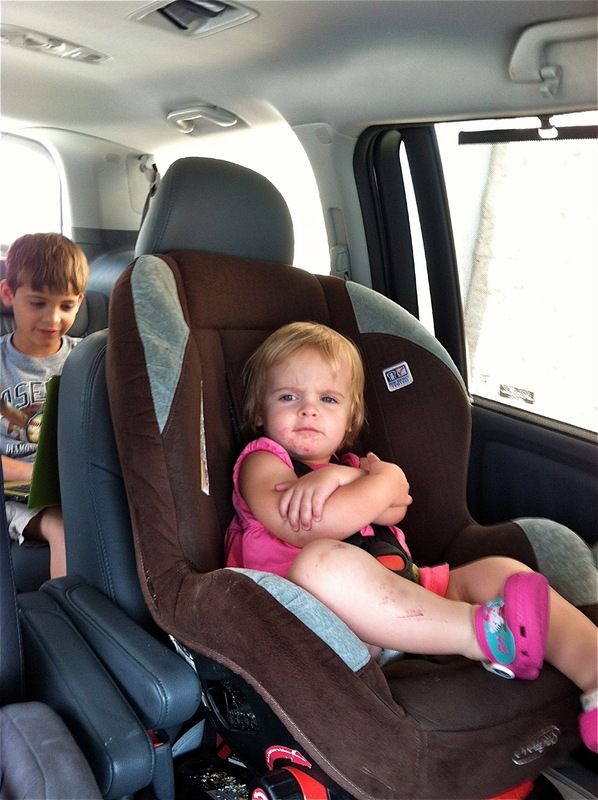 She crossed her arms and gave him a look that said she was majorly PO'd with him. It made us laugh out loud. By Day 3 of our odyssey, even Grayson was getting creative with his phrasing to avoid adding to the tally. "I don't have to use the restroom, but if any of YOU do, I would be willing to go at the same time." The boys were onto him. They said they didn't have to go. He tried again. Nope. Nobody bit. Finally he just looked at me and yelled, "FINE! I HAVE TO GO POTTY!" It's the little things, Internet. On Day 3 we were finally within 19 miles of the beach when we were stopped by a Road Closed sign. Well, I say we were "stopped," but what I really mean is that I drove around the sign and kept going, because the truck in front of me did it. But then the road was flooded and we couldn't get through. Not only that, but we were already in North Carolina when it happened, and our detour took us BACK into South Carolina, which just about had me and Grayson in hysterics. At that point, we were just desperate to GET. THERE. ALREADY. Totally worth it, you know, to get to this view. The beach was deserted because in the three days before we arrived, four people had drowned in riptides at Ocean Isle. Literally NO ONE was in the water, and very few people were on the beach at all. Since we women were headed out for our Annual Epic First Grocery Trip of the Week right after supper, we opted to just let the kids jump in the pool instead of risking the beach on the first evening. Even our littlest waterbug, Amelia, jumped right in. We had a couple more trips to Wal-Mart and a few more trips to the grocery store during the week, but it takes a lot to keep 26 people in food and drinks. This night was one of our quickest trips in our 10 years of this grocery trip ... we made it in a little over two hours. Just curious: Does anyone else look at this picture and get the feeling that I should be lightening my hair by about 21 shades? I always feel like I stick out like a sore thumb when I'm with this group ... my hair looks jet black in comparison!